Paul Dickov says he is shocked by the position of tonight’s hosts Leyton Orient but warned Rovers against underestimating the strugglers. Only goal difference is keeping Fabio Liverani’s side out of League One’s bottom four, just a year on from Orient’s remarkable run to the play-offs. But Dickov says there is still plenty of quality in Liverani’s ranks to hurt Rovers at Brisbane Road this evening. “I’m definitely surprised to see them where they are this season,” Dickov said. “They’ve got a good squad for this level. “The likes of Dean Cox, Chris Dagnall, David Mooney, Darius Henderson – that’s a real handful going forward. “And there’s plenty of experience at the back with Shane Lowry and Nathan Clarke who I had at Oldham. “They’re down at the bottom fighting for their lives. “And you can see that because they’re on a good bit of form, winning two and drawing two in their last four. Dickov has called for his side to play for every point in the remaining five games. 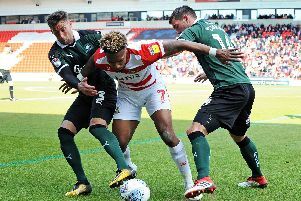 Saturday’s draw against Rochdale ensured Rovers sit ten points and seven places off sixth spot with just 15 points left to play for this season.